life on paper: Feelin' like a Leopard. This again. Can't get over it. That is looking GREAT, Jake! I like the tiger's eye POV. It's a fun way to get us to feel for him. The design of that tiger-man is ridiculously awesome. Way to be, man. 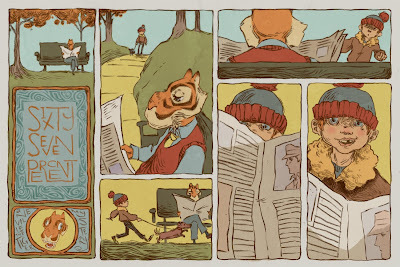 I love that tiger character, and I love the fact that he likes quiet afternoons at the park. Jake you are KILLIN me! I love this stuff, love the super thick muzzle of tiger-dude. I like the kid's face; it's different from your usual kid's faces--which is nice to see. I love the designerly strokes and the simple colors. Very nice dude, keep it up. I love the fact that we are seeing the tiger's view of the boy. I'm all for first person storytelling. And that boy's expression is mastercard priceless. ps, thanks for the keepsake in my sketchbook--I've been having nightmares.